In an effort to capitalize on the success of the popular “mountaineer songs” by the likes of Vernon Dalhart and Kelly Harrell, talent scout and record producer Ralph S. Peer arranged for the Victor Talking Machine Company to make a series of field trips in an effort to discover and record marketable new artists for the burgeoning “hillbilly” market. Arriving in Bristol, Tennessee in late July of 1927, Peer got the word out about the sessions through local radio stations and newspapers, and soon musicians began coming to Bristol in droves to record for Victor. Among the many noted artists who recorded in those sessions were Ernest Stoneman and Blind Alfred Reed. It was in early August, however, when came the artists who were to make the biggest fame for themselves and for the Bristol sessions: the Carter Family and Jimmie Rodgers. When A.P. Carter of Maces Spring, Virginia—not far from Bristol—learned of the sessions, he persuaded his wife Sara and sister-in-law Maybelle to make the short journey from their home to audition for Ralph Peer. Though the trio had made music together since their meeting, only A.P. had inclinations to try and make a career out of it. 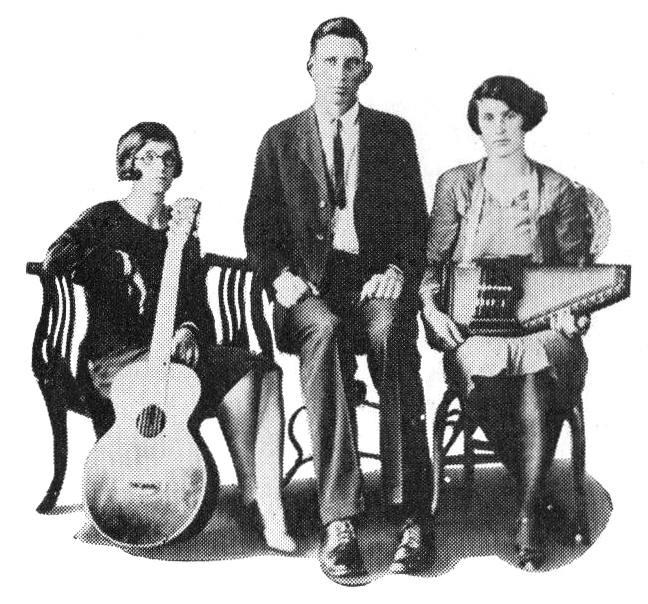 There in Bristol, on the night of August 1, 1927, A.P., Sara, and Maybelle—as the “Carter Family”—recorded four songs: Bury Me Under the Weeping Willow”, “Little Log Cabin By the Sea”, “The Poor Orphan Child”, and “The Storms are On the Ocean”. Their audition went well. Peer was impressed by the Carters, and invited them to return the following morning to record again. They obliged, this time cutting “”Single Girl, Married Girl” and “The Wandering Boy”. In return for these recordings, they were paid fifty dollars per song, and half-a-cent royalties on each record sold. Their second issued record, “Single Girl, Married Girl” and “The Storms are On the Ocean” on Victor 20937, made quite a hit, and the Carters’ path to success as recording stars thus opened. The following May, they traveled to Camden, New Jersey to record again, anticipating the many sessions to come for Victor, Decca, and the American Record Corporation between then and the early 1940s. Thus, the Carter Family’s decades long, multi-generation legacy as one of country music’s most legendary acts of all time began. Victor 20877 was recorded on August 1 and 2, 1927 in Bristol, Tennessee by the Carter Family, Sara, Maybelle, and A.P. Released on November 4, 1927, it was the first issued record, but not the first recorded sides, by the Carter Family. 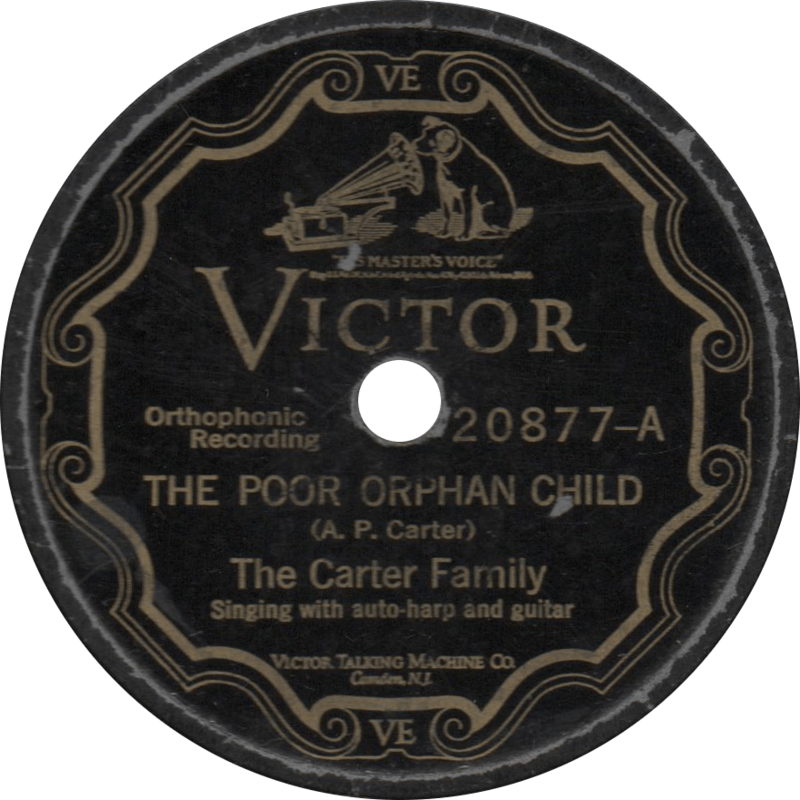 Firstly the Carters sing “The Poor Orphan Child”, the third side recorded at the Carter Family’s first session. The Poor Orphan Child, recorded August 1, 1927 by the Carter Family. On the “B” side, they sing the third title cut at their second session, “The Wandering Boy”. 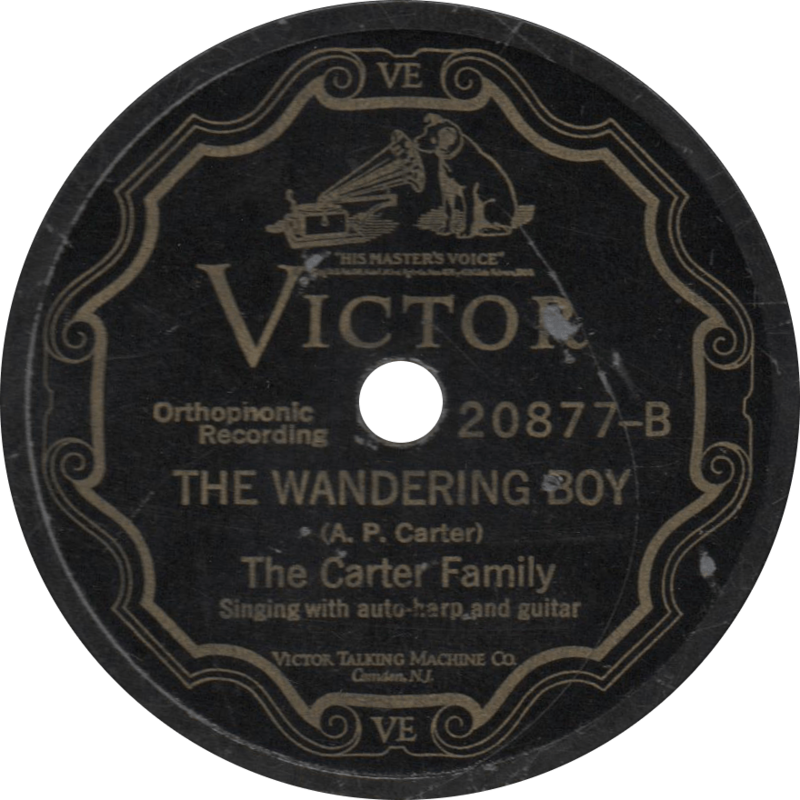 The Wandering Boy, recorded August 2 , 1927 by the Carter Family. This entry was posted in Records and tagged 1920s, 1927, Bristol, Carter Family, Folk, Hillbilly, Ralph Peer, Victor by R. Connor Montgomery. Bookmark the permalink. Just found this site. Keep up the good work.